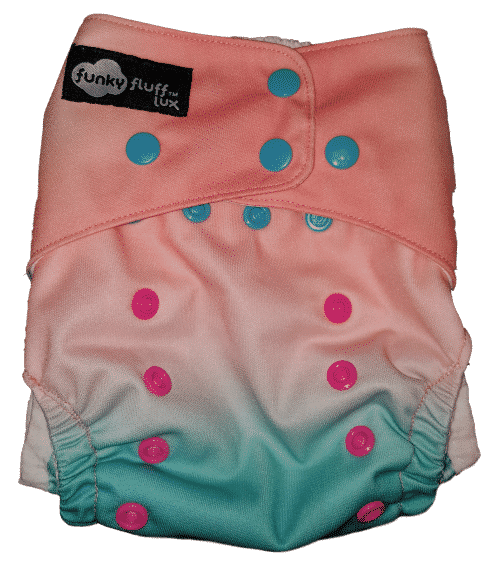 Funky Fluff Swim Diapers…the funkiest flamingo print in the bunch! 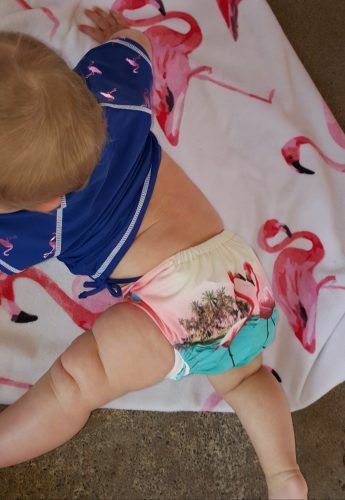 Even parents who use disposable diapers are starting to use cloth swim diapers! Yay! 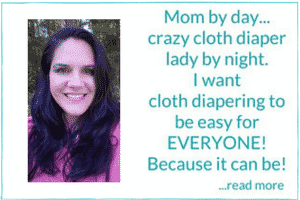 It’s because cloth swim diapers are so easy AND cute! I’ve written about swim diapers before, and since then there are so many more amazing options available. You really can’t go wrong! Swim diapers are not absorbent. If there were, they would soak up the pool/lake/ocean as well. They are made to hold in solids, that’s all. What this means is that solid poo should be contained in a swim diaper and pee will pass through. But, so will exclusively breastfed poo if it’s very runny. Just be aware…and ready for the possibility! 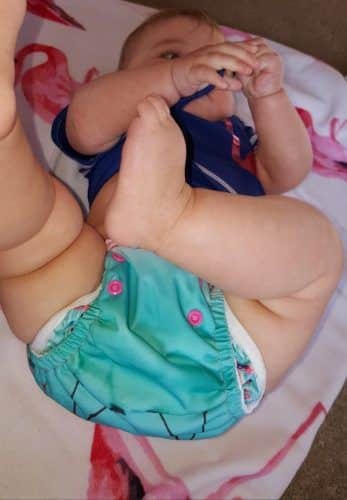 Here is a link to a great post, The Truth about Swim Diapers and Exclusively Breastfed Babies, written by Stephanie Beck for thegreennursery.com. It is an amazing explanation of exactly how swim diapers work and exactly what they will and won’t hold in. If you have a second, you should check it out! 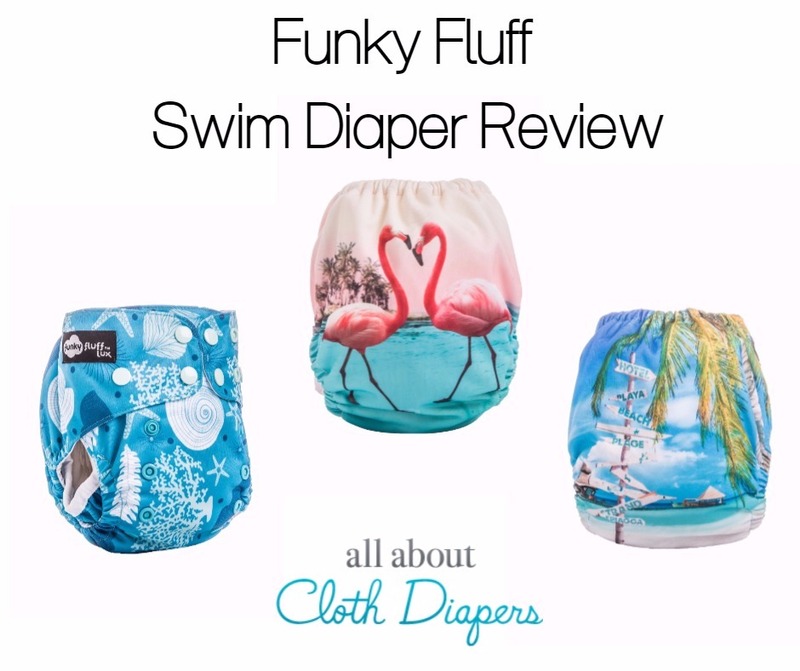 I received a Funky Fluff Swim Diaper to review. All opinions and statements made are 100% honest and true. I have a huge crush on pretty much anything flamingo. As soon as I saw that this print was going to be released I reached out to Funky Fluff to see if I could get my hands on it. I mean come on! Look at those gorgeous pink birds! But if you aren’t a fan, there are a few other choices! Look at the little flamingo details on the double gusset! So cute!! You already know that I LOVE the prints! Amazing material quality and well-made. All Funky Fluff products I’ve tried share the same level of quality. The double leg gussets truly make it easy for anyone to get a great fit on pretty much any baby. Norah has luscious thighs and I had NO issues getting this to fit easily. I’d love to see the Tango/Flamingo print available in a cloth diaper or wet bag! A few action shots of Norah in her Funky Fluff Swim Diaper (and matching flamingo bathing suit and towel)! She is 9 months, 20 lbs and on the 3rd row for the rise. Retail price is $19.95. These are available at your favorite Funky Fluff retailers now. 50% off and FREE SHIPPING! 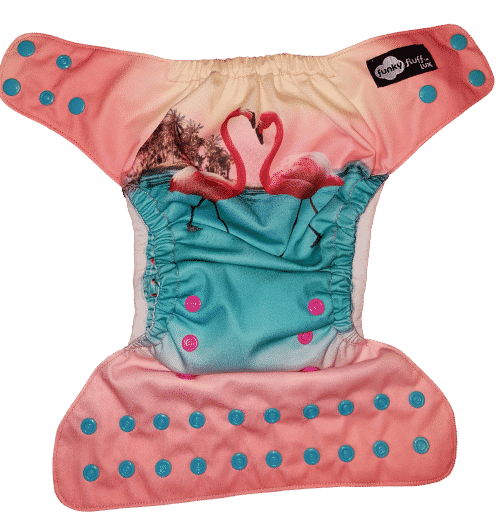 Try Bambino Mio’s Swim Diaper Now! These look amazing! I’d love to have one to use for my son! Love this alternative to disposable swim diapers! 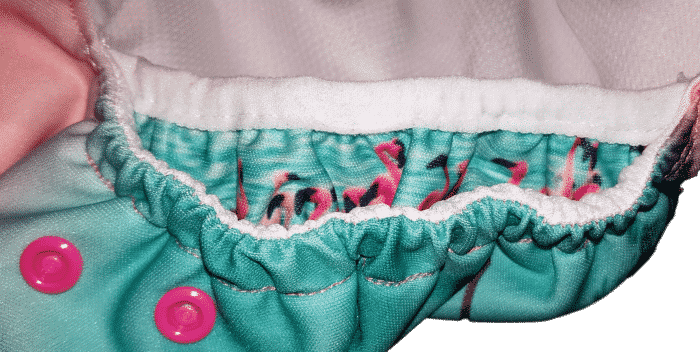 Double gussets are a necessity and the attention to detail (flamingos in the gusset) is awesome! Also, a really good price. Thank you for all the info. Love the print super cute!! Also love that it is a OS! Love the double gussets!! I am curious about the mesh interiortoo. Love these and would love to try…. The meritime would look awesome in my son’s little beach bum. He’s a water baby for sure. I have been looking into swim diapers. I usually just use a pocket without an insert but then I am down a diaper in my small stash. It would be great to have one just for swimming. Love Maritime! Luscious thighs ?? LOVE THEM ALL!!! Double gussets? Oh my goodness!!! I like the maritime my son is potty training a bit early but I think he is wanting to. These are amazing for all !! We obviously have the same tastes in swim diapers. I think the pink flamingos are adorable! I might even be tempted to use one on a future grandson (maybe without my daughter around, LOL!) I am glad that baby stuff is so much cuter than when my children were babies. My first born granddaughter is due in August. This would be cute for her! The double gussets actually lool comfy on these! We would love to own a La vida loca for our lil Florida Bradley boy#3! These are great! We love cloth diapering and have been looking for a swim one for a while now. Love the double gusset! Is there actually pul? Our is it just a non waterproof stretchy material? 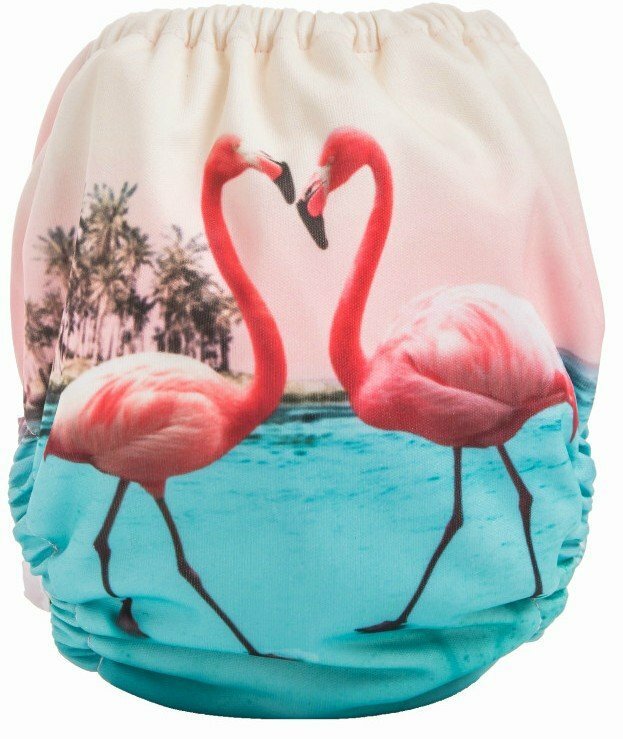 I would ADORE the flamingo print in a wet/dry bag! You should definitely try to talk the company into it! Awesome. They look amazing with the gussets and so freaking cute. Love these patterns. Funky Fluff is one of two brand of CD I use. 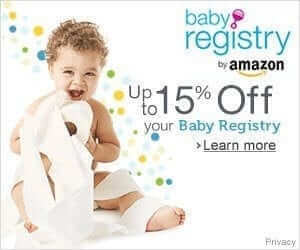 Great for infants! I love the flamingo print ??? I think double gussets are a must in a swim diaper;! Perfect for the summer!!! Love the prints! 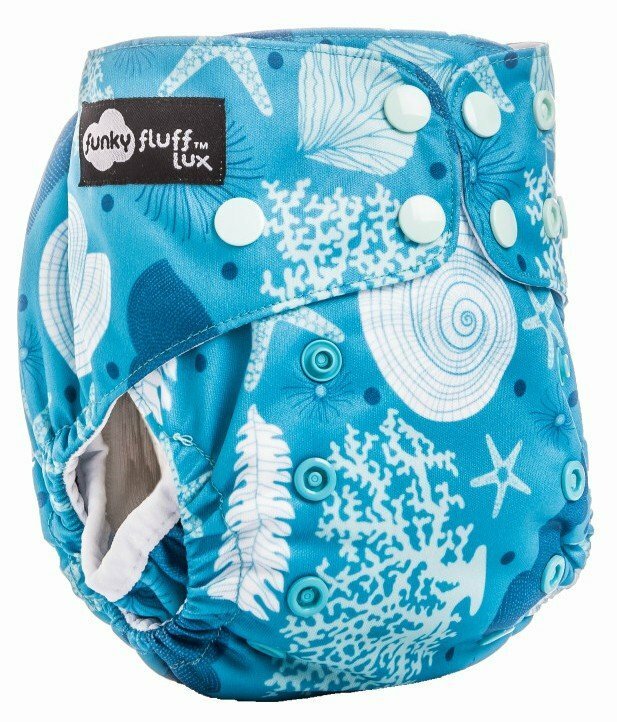 I have been looking into swim diapers and this one looks adorable and comfy! I’m in LOVE with that flamingo print as well ??? Be nice to have matching wetbags! In love with Maritime? Wish I had a little girl to put the flamingo one on!!!! I absolutely love these patterns, they are all so adorable!! Usually I don’t like double gussets but I think it is an awesome idea for a swim diaper! Plus these prints are gorgeous ? Omg so cute!!!! Love how you mention it’s good for her luscious thighs… my sweet boy def has some good ones too!!! ? These are just so cute! I absolutely love those flamingos! I love the patterns of these swim diapers!